“Hi, my name is Guido. 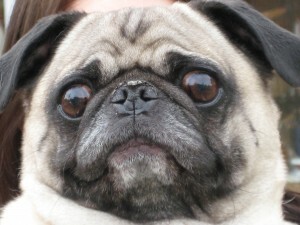 I am 5 years old and came to Pug Partners after my owner went into hospice care. I lived with a single lady who spoiled me, but in my new foster home I am adjusting great. I am potty trained and current on all shots. I have to admit, I’m a little spoiled boy and definitely love cuddling up at night. I sleep in my foster family’s bed and not in a crate. I’m really not a fan of that crate thing. I’ve had alot of change in a short period of time so I am adjusting, but I may be best in a quiet home without alot of commotion. I promise if you take good care of me I will bond and thank you with unconditional love. Will you be my forever home? Guido’s adoption fee is $300. My husband and I and our three daughters met Guido on Sunday, April 17 at the Three Dog Bakery at your meet and greet. We are interested in taking the necessary steps to make him part of our family. I am available via e-mail or by phone at 402/334-6771 any time. I look forward to hearing from you.